Gardens make urban life more live-able. The professional gardeners at Spotts believe that any slice of the outdoors, whether balcony or backyard, can be transformed into functional, organic greenspace. And, that everyone deserves an outdoor oasis. Maybe an outdoor space is palatial, or maybe it’s a postage stamp. Regardless of size, every parcel is personal and full of possibility. In each new client consultation, the gardeners at Spotts ask a key question: How do you hope to use your outdoor space? For some, the answer is yoga or reading. For others, cooking and entertaining. Or, simply sunbathing. As mentioned, the gardeners at Spotts focus on lifestyle. Now, their website does too. Gardens are organized by type, e.g., yoga garden, reading garden, vegetable garden. As a result, clients can easily discover the right garden for them. But, discovering the right type of garden is only half of the equation. It has to look great too. Unfortunately, it’s tough to photograph newly planted gardens. After installation, they can take up to three years to look mature. For the website, this limited the availability of before-and-after photos. Illustrations are a perfect fit. So, how did we design around this limitation? In this case, with hand-painted illustrations of plants, tools, and containers. Now, these appear across the marketing suite, from the website to work trucks. 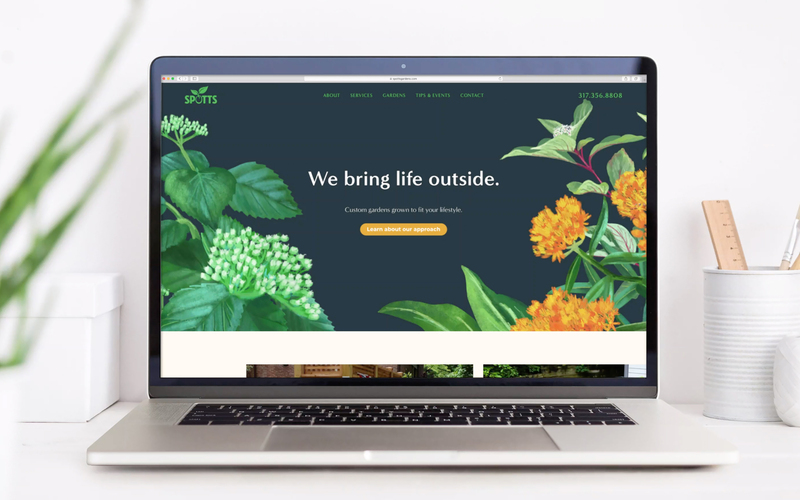 Today, the Spotts website design showcases what clients can expect: beautiful, functional, and earth-friendly custom gardens. 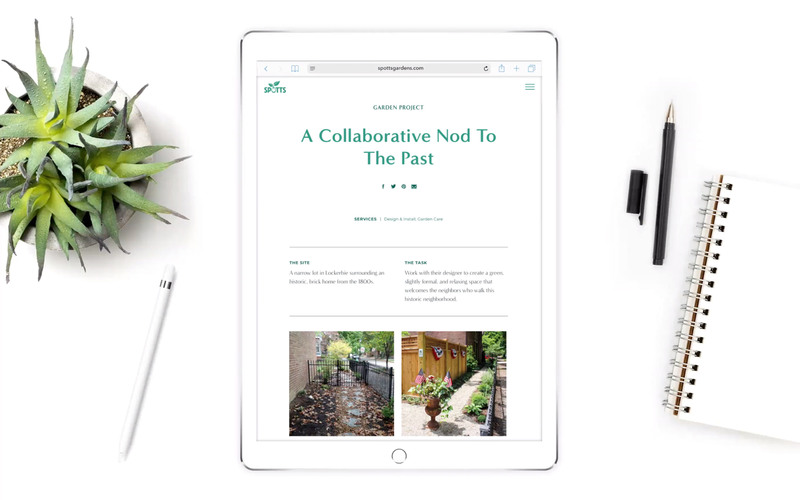 Does your website design feel tired? Get in touch.